Get rid of those ugly cables and enjoy the freedom of wireless on your Airport capable PowerMac G4, Powerbook, iBook or iMac with an Apple Airport Card. With speeds of up to 11Mbps you can surf the web up to 150 feet from your Airport Base Station or wireless access point. Compatible with any 'Airport Ready' Apple Powerbook G3, G4, iBook G3, iMac G3, G4, eMac, G4 Cube and PowerMac G4 that does not use an Airport Extreme Card. Please see the Specs and 'Additional Information' below for more specific info on this item. 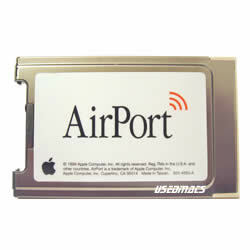 This used Apple wireless card for a Apple Mac Desktops and laptops is in stock and ready to ship.